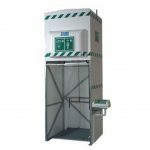 A safety shower is designed to wash your head and body if they come into contact with hazardous chemicals. Large volumes of water are used. You may need to take off clothing that has been contaminated. Safety showers cannot be used for flushing eyes due to the high pressure of water from the shower. An eyewash station is used for washing chemicals or substances that splash into your eyes before you can seek further medical attention. It is recommended that the user washes their eyes for at least 5 minutes. Early eyewashes were designed with a single rinsing stream. Eyewashes are now capable of flushing both eyes at the same time. A pH neutral solution for emergency eyewash may also be chosen to reduce the danger from contaminants if strong acids or alkali chemicals are presented. A drench hose is equipment that can spray water to a specific spot on the body. 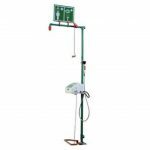 It can be applied to an individual who cannot reach an eyewash or shower station or if the eyewash and shower station are not available. A combination unit is where a shower station, eyewash station, and drench hose share the same water supply. They are useful in laboratory applications where hazardous chemicals with different properties are used. Your personal eyewash bottle or unit is a supplementary. 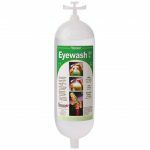 Eyewash stations cannot be replaced by bottles as they do not meet safety standards. 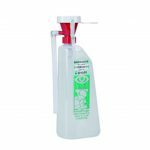 Eyewash bottles allow you to flush the injured area immediately, or until you can reach the fixed eyewash station.